솔부엉이의 몸길이는 약 25㎝이다. 머리·등·꼬리는 진한 갈색이고, 가슴과 배는 흰색으로 암갈색의 세로줄무늬가 있다. 꼬리에는 암갈색의 가로띠가 있으며, 부리와 발은 노랗다. 여름새로 숲의 나무나 도시의 공원 등에서 생활한다. 주로 밤에 활동하고, 곤충, 박쥐, 작은 들새를 먹고 산다. 올빼미와 부엉이류는 오염된 먹이로 인해서 생존에 위협을 받고 있으며 번식지를 비롯한 월동지와 서식지의 파괴, 인간에 의한 마구잡이 등의 원인으로 나날이 그 수가 감소하고 있다. 올빼미와 부엉이류는 국제적으로 보호되고 있는 새들로서 우리나라에서도 10종 중 7종을 천연기념물로 지정하여 보호하고 있다. 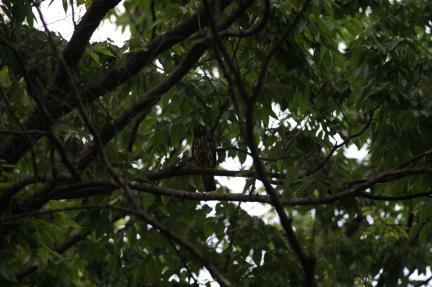 The brown hawk-owl (Ninox scutulata) is about 25㎝ long. 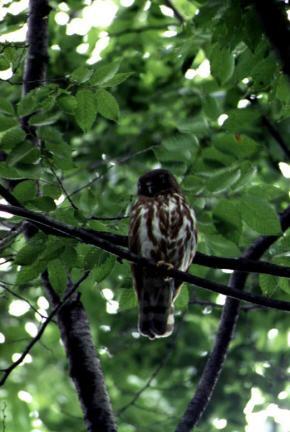 The head, back and the tail are dark brown, and the breast and belly white with dark brown vertical streaks. The tail has dark brown banding, and the beak and talons are yellow. 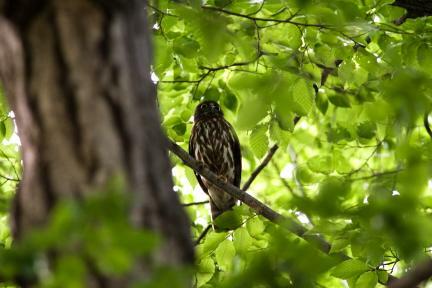 The bird of prey is a summer bird in Korea, encountered usually in woods or city parks. Mostly nocturnal, the brown hawk-owl feeds on insects, bats and small wild birds. Owls and true owls are today threatened due to the contamination of their food supply. The destruction of their habitats and breeding and wintering grounds is another contributing factor, along with poaching, to their rapidly dwindling numbers. Owls and true owls are protected bird species worldwide. In Korea, seven of the ten locally recorded owl species are protected under designation as Natural Monuments.